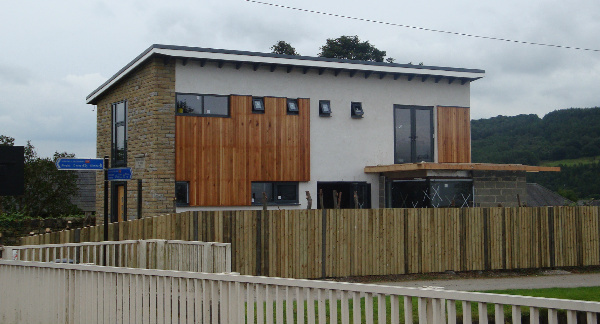 Our contemporary new bespoke dwelling on the banks of the Leeds & Liverpool canal in East Morton, near Bingley has been progressing well since our last blog a couple of months ago, and is now nearing completion. The structural glass balcony, overlooking the canal, is due to be installed imminently, following the recently applied render finish. With the main building works due to be complete before the onset of the winter, the contractor can now focus his attention on completing the internal fit-out works, which promise to include some interest contemporary architectural details. We’re very much looking forward to seeing the completed dwelling in all its finalised glory, and obviously uploading some “as-built” photographs into our projects section in due course…. Wow ….really good architectural design building.It’s look very different to another building design.I think simple living high thinking.Thanks for share brilliant blog with us.